Are you planning a Worldschooling adventure? If you are thinking of going on the road with your family, this worldschooling checklist is for you. If you are a short-term Worldschooling family some of these things can also be of use if you take short trips or even camping! Yes, this post has affiliate links because us Worldschoolers have to invent new ways of funding our crazy lifestyles and make money on the road! Thanks in advance if you do click through and purchase any of the items I chose for “The Worldschooling Checklist”, with everything you need to educate your kids while traveling. Keep in mind that this list is full of my own personal picks, the checklist for your worldschooling family might be completely different and that is totally fine. Some of the items are interchangeable in terms of brand, size, prize; I just picked the ones I like. I’d love to hear which are your favorites! We live in a technological world, so we have to use this to our advantage. No matter if you are worldschooling at home or a hut in the jungle, some or all of these will come in handy. Some of these are for the photographers and filmmakers in you. Our kids use an iPad and a Samsung tablet for all the things they need to do. They do online schooling with Khan Academy and Time4Learning and my daughter does Dyslexia Games with the stylus. Technology, as you know comes in all shapes and sizes. The links below will take you to a category page where you can pick your own favorite. What are your favorite tech products for worldschooling? Share in the comments! As you well know, books are the best! But you can’t obviously travel with an entire library. Some of these books have kindle versions! The majority of these books are for the kids to have the entire world at their fingertips. Even if you are staying home or traveling far, having any of these books on hand gives your kids the opportunity to know just how broad the world is, and how much there is to discover. Below In the Amazon suggestions, I have included two books about Roadschooling because they have good tips and ideas and one is interactive, like a journal! Of course this list of books is only the tip of the iceberg of all the great books in the amazing Amazon Library. I have listed the ones I like the best, I’m sure you can find specific books about the area you are planning to travel to. Like my favorite; TravelKids Thailand. Big Kiddo’s favorite book on this list is the Lonely Planet’s The World’s Great Wonders. He especially likes the chapters about Stonehenge and the giant redwood trees in California. A great way for the kids (and the parents) to immerse themselves in the adventure is to make art or write. Journaling is one of the greatest resources for a worldschooler. And if your family is the stay at home kind, there is still so much to discover. A trip to the park, mall, coffee shop and a little drawing session of whatever you see there is a great exercise for the creative mind. Scrapbooking and keeping ticket stubs of visited places is also a great memory creator for looking back in the future. I personally love travel watercolor sets and mini notebooks for quick doodles. I am a big fan of the Urban Sketches website. This list is mostly for traveling Worldschoolers, for all sorts of travel; Slow, fast paced, long term. These items come in handy all the time! And if you are a stay at home Worldschooling family you might go camping somewhere close by, or have a little overnight in the backyard. We are HUGE fans of packing cubes, they literally make our nomad life so much easier. A large part of Worldschooling is making a living on the road. One option is blogging, specifically with affiliate programs. We make money on the road with graphic and web design and also freelance writing. The Worldschoolers FB Group is a great place to meet other Worldschoolers and they have a Monday Money post thread where you can learn tons about making money on the road. If you made it all this way, thanks for reading! 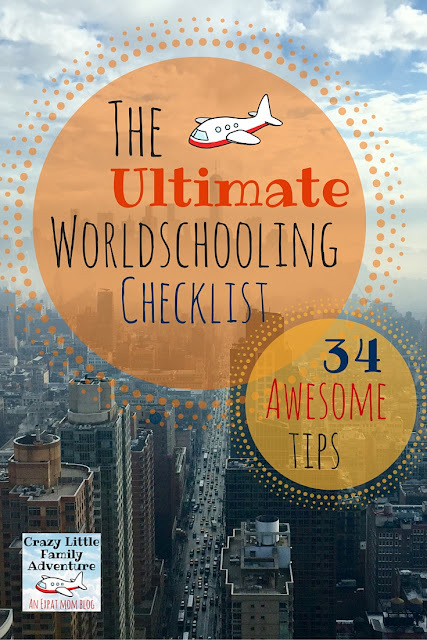 I hope you enjoyed The Ultimate Worldschooling Checklist!